PAIR: These chiffon bracelets are ideal for your wrists or ankles. 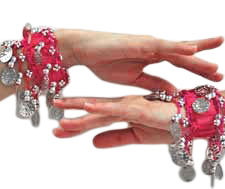 These colorful bracelets with metal coins and beads add the classic belly dance accent to any belly dance costume. Chiffon fabric over an elastic base makes for a comfortable and adjustable fit. One size - stretches up to 10 inches. Can be worn as bracelets or anklets. Sold as a pair. I ordered several of these for my granddaughters and surprised them with a bellydance class. They were great quality, vivid colors, and quick shipping! The bracelets are very well made with nice, shiny coins on each side of the bracelet. The color, however, is not a true fuchsia. They are more of a salmon pink and do not match the coin fuchsia headband. I did keep them and will put a band of fuchsia sequins in the middle. They measure about 7 3/4 in. around. They would stay up higher on the arm if too large for wrists.